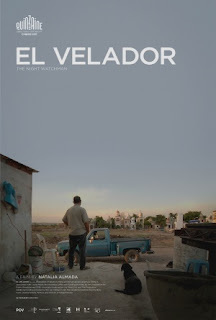 If one didn’t have liner notes to what EL VELADOR was all about, the nonfiction feature would be pretty much mystifying. In confronting the potentially searing topic of drug violence and fatalities in modern-day Mexico, filmmaker Natalia Almada tries a minimalist approach to a maximalist problem, presenting, with no preamble, no interviews, no explanatory narration, the day-to-day routine of a town cemetery kept "busy" by the carnage, even though most of what we see is quiet and deceptively siesta-peaceful. Gravediggers and groundskeepers, mostly silent, do their work with portable radios on. The night watchman arrives. Attractive young women in black sweep dust off mausoleums and memorials – and only with the press release material accompanying can one figure out that these shapely senoritas are, in fact, the bereaved widows, whose children play among the headstones. Every so often a mariachi-band procession comes along, onlookers look on, and yet another young male slain, almost certainly in connection with cartel wars, gets interred. And then the cemetery sits in the sun and waits impassively for the night watchman to arrive and the cycle to begin again, the graveyard awaiting its next permanent residents. An English-language TV broadcast near the end spells out the meaning, that the United States pours billions into a distant conflict in Afghanistan and hardly anything into this ongoing terror on its very doorstep.